Plein Soleil DG, 3-room apartment on the top floor. Cosy and wooden furniture furnishings: living/dining room with cable TV. Exit to the balcony. 1 room with 2 beds (90 cm, length 200 cm). 1 small room with 1 x 2 bunk beds (90 cm, length 200 cm). Kitchen (oven, dishwasher, 4 ceramic glass hob hotplates, electric coffee machine, Capsules for coffee machine (Nespresso) extra, fondue Set (cheese)). Bath/WC. Balcony, west facing position. Balcony furniture. Marvellous panoramic view of the mountains and the valley. Facilities: iron, hair dryer. Internet (WiFi, free). Please note: suitable for families. Non-smokers only. Arrival is only possible by train from Lauterbrunnen - 14 minutes driving time. 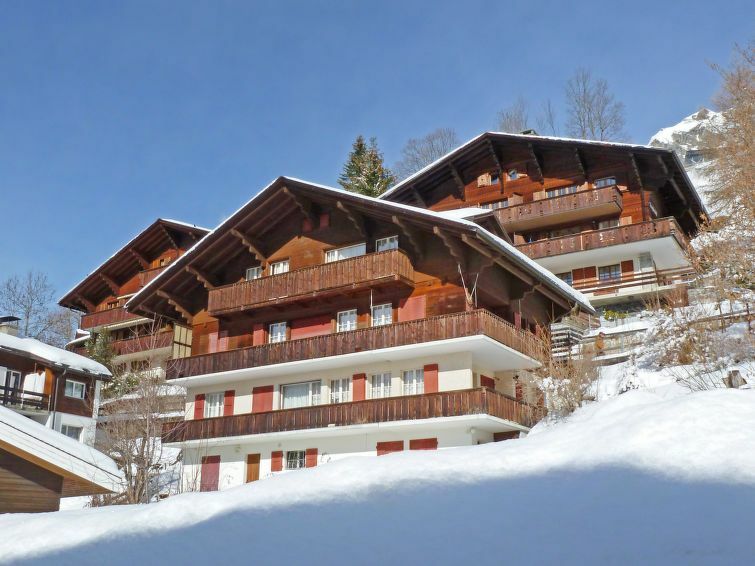 Chalet Plein Soleil. Below Wengen 600 m from the centre of Wengen, in a quiet, sunny position on a slope. Pre-arrival grocery service. Shop, supermarket 600 m, restaurant 300 m, bakery 600 m, 7 minute walk to the centre, railway station Wengen 600 m. Cable car 600 m. Please note: car-free holiday complex. Arrival via mountain railway. Great accommodations. It’s about a 5 minute uphill walk to the train station. Fortunately you do not have to carry your skis since you can leave them at ski depot.